21st October 1772, Ottery St. Mary, Devon, England. Samuel Taylor Coleridge was the tenth and youngest child of the local vicar and his second wife. Henry the Eighth Free Grammar School, Ottery St Mary. Christ’s Hospital. Jesus College Cambridge (ran away to join the Dragoons under the alias of Silas Tomkyn Comberbache and had to be bought out by his brothers). 1781: Death of his father dies on the 6th October. 1782: Coleridge goes to Christ’s Hospital School in London and meets his lifelong friend Charles Lamb. 1791: He enters Jesus College, Cambridge. 1793: On the 2nd December he enlists in the 15th Light Dragoons as Silas Tomkyn Comberbache. 1794: Returns to Cambridge after being bought out of the army by his disgusted brothers. In June he meets Robert Southey for the first time and they plan a theory of Pantisocracy where all members of a community are given specific tasks. They plan to emigrate to North America and set up their group there. His first poems are published in the London newspaper the “Morning Chronicle” in July. Works on and publishes a play entitled “The Fall of Robespierre”. In December he leaves Cambridge without completing his degree and goes on a tour of Wales. 1795: To earn some money Coleridge delivers a series of lectures at Bristol on politics, history, religion and the slave trade. Probably sees William Wordsworth for the first time. Is introduced to the Fricker sisters by Southey who marries Edith. Coleridge moves to Clevedon in Somerset after his marriage to Sarah. 1796: Coleridge produces the radical political and philosophical journal called “The Watchman” between March and May. on the 16th April he publishes “Poems on Various Subjects”. His son Hartley is born on the 19th September. The Coleridge family move to a small cottage at Nether Stowey in Somerset on New Year’s Eve. 1797: The first proper meeting with William Wordsworth and his sister Dorothy takes place on the 5th June. In July Wordsworth and Lamb visit Coleridge in Nether Stowey. Due to an accident with some scalding milk on 14th July Coleridge cannot go out walking with them and this produces the poem “This Lime Tree Bower My Prison”. Wordsworth and his sister rent Alfoxden House nearby. On the 13th November he begins writing “The Ancient Mariner”. In December he is employed as a writer for the “Morning Post” newspaper. Some of Coleridge’s poetry is published in the “Morning Post”. He finishes the first section of “Christabel” and writes his play “Osorio”. 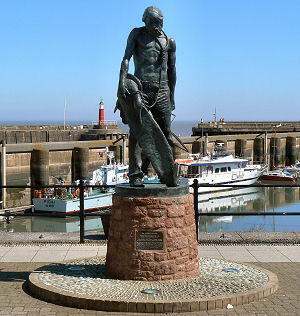 Statue of the Ancient Mariner in Watchet Harbour, Somerset from where the Mariner was said to have set sail. 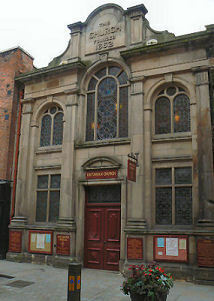 1798: Coleridge gives sermons at the Unitarian Church in Shrewsbury as he is intent on taking up a life of religion, but receives a life annuity of £150 from Tom Wedgwood (son of Sir Josiah Wedgwood) to dedicate himself to poetry. Meets William Hazlitt for the first time. In February he writes “Frost at Midnight”. In March he completes “The Ancient Mariner.” His second son Berkeley is born on the 14th May. (he is named after the famous Irish Philosopher George Berkeley). He writes “Kubla Khan” after awaking from an opium induced dream. (He needed to take opium in the commonly available liquid form laudanum for stomach and other pains). Famously the poem was not completed as he was disturbed at Ash Farm by “a person on business from Porlock”. On the 18th September Wordsworth and Coleridge finally publish their joint venture the “Lyrical Ballads”. (Wordsworth was not happy to see “The Ancient Mariner” included). Coleridge leaves for Germany on the 19th September on a study tour with the Wordsworths hoping to increase his knowledge of language and philosophy. 1799: On the 12th February Coleridge studies at the University of Gottingen. In April news reaches him from his good friend in Nether Stowey, Tom Poole, about the death of his son Berkeley. He returns to England in July. In October he experiments with the effects of Nitrous Oxide (Laughing Gas) with Humphry Davy in Bristol. On the 26th October he meets Sara Hutchinson for the first time in the Lake District. In November) he begins writing political essays for the “Morning Post”. He stays with the Godwins at 29 The Polygon, London. 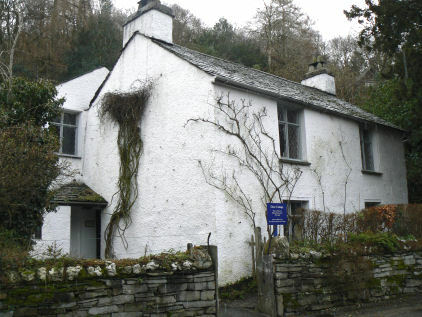 In December the Wordsworths move to Dove Cottage, Grasmere in the Lake District. 1800: Coleridge begins translating Schiller’s “Wallenstein” whilst staying with Charles Lamb and his sister. On the 24th July the Coleridge family all move to Greta Hall in Keswick. Derwent his third son is born on the 14th September. He finishes “Christabel” In December he has a prolonged illness including rheumatic fever and this may well be the time that he became addicted to the painkiller opium and its variant Laudanum. 1801: New edition of the “Lyrical Ballads” with Wordsworth’s Preface. 1802: Attends Humphry Davy’s lectures at the Royal Institution. (June) Publishes “Poems”. (November) Tours Wales with Tom and Sally Wedgwood. Southey Family moves in to Greta Hall in Keswick with Sarah Coleridge (Southey’s wife’s sister). His daughter Sara is born on 23rd December. Greta Hall, Main Street, Keswick, Cumbria. Coleridge’s study is behind the first floor window on the far left. This is one of the great literary houses of Britain. Besides being the family home of the Coleridges and Southeys, visitors included Wordsworth, Byron, Keats, Shelley, Walter Scott , De Quincey, John Stuart Mill, Charles Lamb, John Ruskin, Humphry Davy, William Hazlitt and William Wilberforce amongst others. 1803: Coleridge tours Scotland with the Wordsworths during August. 1804: In January Coleridge is ill once more in Grasmere and then returns to London. In July he moves to Malta for the good of his health and becomes Undersecretary to Alexander Ball, the British High Commissioner. 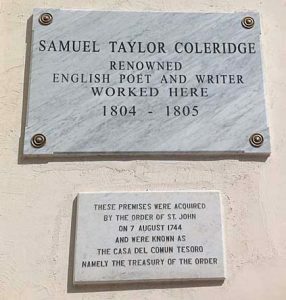 1805: On the 18th January Coleridge is officially appointed Acting Public Secretary in Malta and helps write laws and statutes for the country. On the 21st September he leaves Malta and tours Naples, Rome , Florence, Pisa and Leghorn. 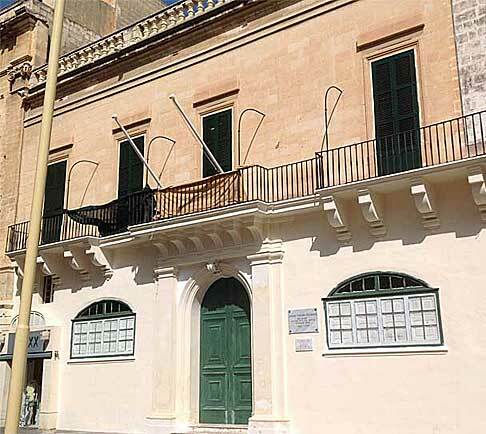 The House in Republic Street, Valletta, Malta where Coleridge worked on a daily basis. (Photograph kindly supplied by copyright Jack Potts. 1806: On the 17th August he returns to England although still not in good health. He stays with the Godwins at 29 The Polygon, London and delivers a series of lectures on Shakespeare at the Corporation Hall in Fetter Lane London. Lord Byron is in the audience as well as William Godwin and his young daughter Mary (later to become Mary Shelley. He arrives back at Greta Hall in November. In December he leaves to live with Wordsworth and his wife Mary (Also Dorothy and Mary’s sister Sara Hutchinson) in Coleorton, Leicestershire. 1807: In January Coleridge hears Wordsworth read “The Prelude”. He meets Thomas de Quincey in Bristol in August. 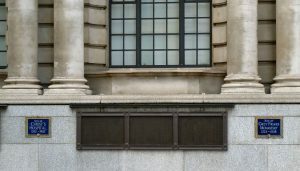 1808: In January he starts living in the Courier Building in the Strand, London. He starts lecturing on poetry and the principles of taste at the Royal Institution. 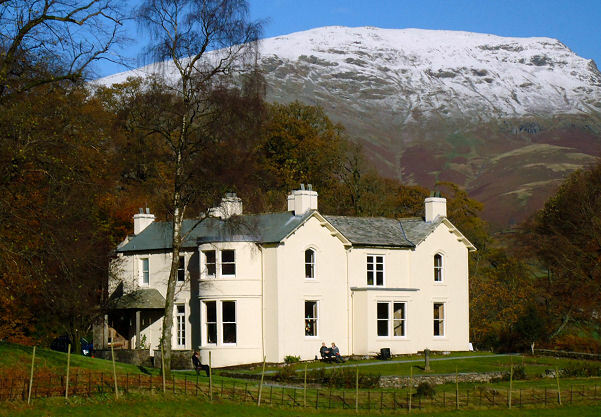 He becomes ill again and goes to live with the Wordsworths at Allan Bank in Grasmere, Cumbria. 1809: In August Coleridge produces “The Friend” a political and philosophical periodical. 1810: In March Sarah Hutchinson (known to him as Asra) tells him she has never loved him. In October he moves to London and has a breach with the Wordsworths over a statement by Montague about Wordsworth’s opinion of his work. 1811: “Table Talk” is first written down by his nephew John Taylor Coleridge in London as Coleridge is known as a voracious and entertaining speaker. In November he begins a series of lectures on Shakespeare and Milton at Scot’s Corporation Hall for the London Philosophical Society. 1812: In February he makes his last visit to the Lake District. In April he goes to live with the Morgans. In May he begins a series of lectures on drama at Willis’s Rooms, London. Charles Lamb helps heal the rift with Wordsworth. In October he lectures on Shakespeare and education at Bristol and Milton in Clifton. His annuity from the Wedgwoods is reduced to £75. In November he lectures on Belles Lettres, Shakespeare and education at the Surrey Institution. 1813: Beginning of the successful run of his play “Remorse” at Drury Lane, London on 23rd January. In October he lectures in Bristol on Milton, Cervantes, taste, The French Revolution, Napoleon, etc. 1814: In May he is looked after by Doctor Daniel for addiction and suicidal depression. In August “Remorse” is performed in Bristol. In September he publishes essays in the “Courier” newspaper. 1815: Coleridge moves with the Morgans to Calne in Wiltshire. In June “Remorse” is produced in Calne. In July he writes the “Biographia Literaria”. 1816: In February he receives grants from the Literary Fund and from Lord Byron. On the 16th April he enters the house of Doctor James Gillman and his wife in Highgate who try to control his addiction. He writes “Theory of Life” in November. 1817: “Remorse” is performed again in London during April. 1818: Coleridge lectures in London in January on judgment, culture, European literature, etc. In December he lectures on the history of philosophy, Shakespeare, Milton, Dante, Spenser and Cervantes. 1819: On the 11th April he meets John Keats whilst out walking. He begins to write occasional articles for Blackwood’s Magazine. 1822: A series of regular Thursday evening monologues begin in November. 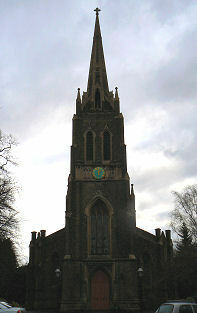 He is visited in Highgate by his wife and daughter. On the 29th December his nephew H.N. Coleridge starts recording his “Table Talk”. 1824: He is elected a Fellow of the Royal Society for Literature. In June he meets Thomas Carlyle. 1825: Lectures on Aechylus’s “Prometheus” at the Royal Society of Literature. Derwent Coleridge ordained as a clergyman in May. 1827: He becomes seriously ill in May. 1828: In April he meets James Fennimore Cooper. In June he tours the Netherlands and the Rhineland with Wordsworth and his daughter Dora. 1829: On the 3rd September his daughter Sara marries her cousin H.N. Coleridge. 1831: He is visited by the philosopher John Stuart Mill. He attends meetings of the British Association in September. 1833: In June Coleridge visits Cambridge for the British Association meetings and on the 5th August he is visited by Ralph Waldo Emerson. 1794: “The Fall of Robespierre” (with Southey). “Monody on the Death of Chatterton”. 1796: “Poems on Various Subjects”. started the political journal “The Watchman”. 1797: Wrote “Osorio”, which was staged in 1813 as “Remorse”. “Christabel, Part 1”. 1798: “Frost at Midnight”. “The Rime of the Ancient Mariner”. (As part of Lyrical Ballads with Wordsworth) “Kubla Khan”. “Fears in Solitude”. “France: An Ode”. “The Nightingale”. 1800: “Poems – New Edition of Lyrical Ballads” with Wordsworth. 1803: “Lyrical Ballads” (Third Edition). 1816: “The Statesman’s Manual”. “A Lay Sermon”. “Christabel”. “Kubla Khan” and “The Pains of Sleep”. 1817: “Biographia Literaria”. “Sybilline Leaves”. 1818: “A Treatise on Method”. 1830: “On the Constitution of the Church and State”. “The Devil’s Walk”. (1835): “Specimens of Table Talk”. (1840): “Confessions of an Inquiring Spirit”. (1849): “Notes and Lectures and Some of the old dramatists”. (1850): “Essays on his Own Times”. 4th October 1795 to Sarah Fricker at St. Mary Redcliffe, Bristol. (The same church where the manuscript of Chatterton’s “Rowley” had been found. Sarah was the sister of Edith Fricker who became the wife of Coleridge’s Friend Robert Southey. 25th July 1834, Highgate, London. Monument in the aisle of St. Michael’s Church, Highgate, London, England. (where Coleridge was reburied on 6th June 1961 after his first location, near the chapel buildings of Highgate School, became derelict. John Masefield then poet Laureate was at the ceremony). Dove Cottage and Museum, Grasmere. (Wordsworth Trust). Greta Hall, Keswick. Now a private family home of the musician Scott Ligertwood and his partner Jeronime Palmer, however parts of the house and buildings are available for holiday let, including the Coleridge wing) Coleridge lived here with Southey and Sarah Coleridge. Allan Bank, Grasmere. 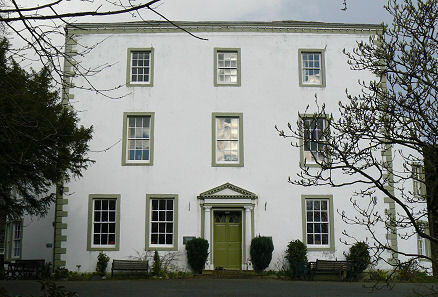 Former home of the Wordsworth’s where Coleridge lived for a time. Now opened by the National Trust. The Valley of Rocks, Lynton, Devon. (Coleridge walked from Stowey along the Coast many times with Wordsworth and other friends). Ash Farm, near Porlock, (Private residence). (Where “Kubla Khan” was conceived). 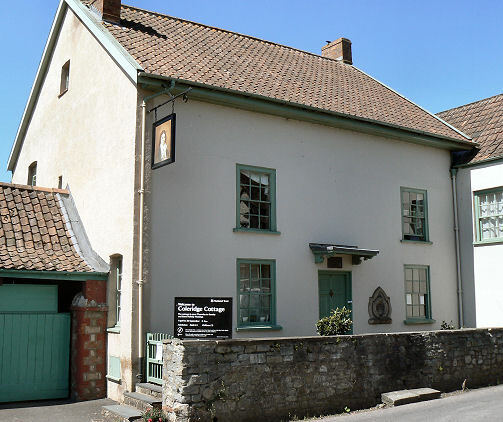 Coleridge Cottage, 35 Lime Street, Nether Stowey, Near Bridgewater. (National Trust). Quantock Hills. (Coleridge walked amongst these hills frequently with William and Dorothy Wordsworth. Watchet. (Port said to be inspiration for “Rime of the Ancient Mariner”). A statue of the Ancient Mariner Sculpted by Alan B Herriot of Penicuik Scotland was unveiled on the Harbourside in 2003. 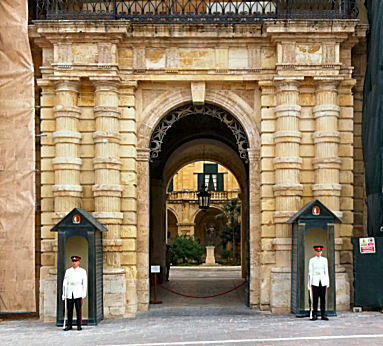 The Presidential Palace and the Casino Maltese, Valletta. Friends of Coleridge, c/o David Cheshire, 7 Walls Road, Bath, BA7 3AN.